Went over to the coast for the weekend, camping at a Thousand Trails park in Pacific City. Our first day was absolutely gorgeous - sunny and warm. Watched the sun set over the ocean right from the campground. 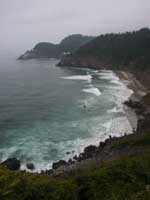 The next day we followed the 3 capes scenic route up the coast, stopping at Cape Mears and Cape Lookout. Unfortunately the fog had come in overnight but it was still great scenery. Stopped at Tillamook for a tour of the Cheese Factory. Great gift shop and ice cream! Took the coast route south from Pacific City to Florence before heading back inland to Eugene. Stopped at Mo's in old town Florence for their famous chowder and of course had to hit a couple of the quaint shops. Met our new friends from the rally for dinner on the Willamette River. Had some routine maintenance done on the RV, including a steam cleaning of the engine to get off all that Alaska Hiway dirt. Then headed south into CA to visit friends in Roseville. We had met Chuck and Darlene on our caravan to the Maritimes two years ago and have stayed in touch. By now we were having withdrawals from not playing games since Robbie and Steve left for home. Fortunately Chuck and Darlene are also game players and we really enjoyed our visit with them. Darlene told me about the apple festival going on in Apple Hill just outside Placerville. Lots of craft booths, home made pies and jams. So we decided to route ourselves home through Placerville. Fred had caught a cold and was feeling puny so once we reached the campground he went to bed. I took the car and made the rounds of all the orchards. Of course I found some things I couldn't do without. Fred was especially grateful for the yummy apple pie I brought back. From Placerville we headed east on 50 and up the mountains through South Lake Tahoe. Pretty drive though a little narrow and windy at times. Headed south on 395 and stopped in Lee Vining for the night. 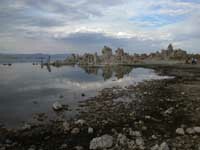 Turns out our campground was right across the road from Mono Lake. We had never been there before so hurried over to the visitor center before it closed. Saw a great slide show and video about the lake and learned that it is 2.5 times saltier than the Pacific Ocean. This is particularly amazing since it is a completely landlocked lake with no inlet from the ocean. 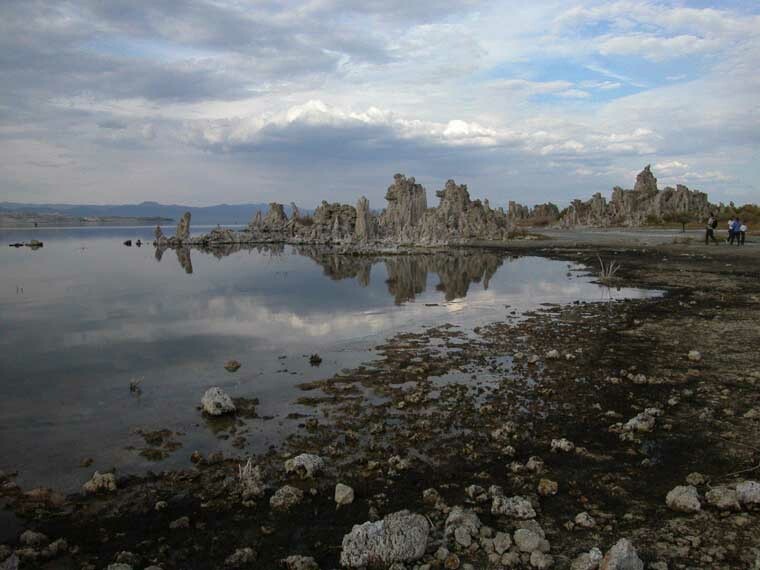 Because of its salt content, there is no sealife in the lake except for millions of brine shrimp. These are harvested in the summer as food for aquarium fish. 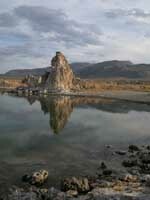 Mono Lake is a photographer's dream. 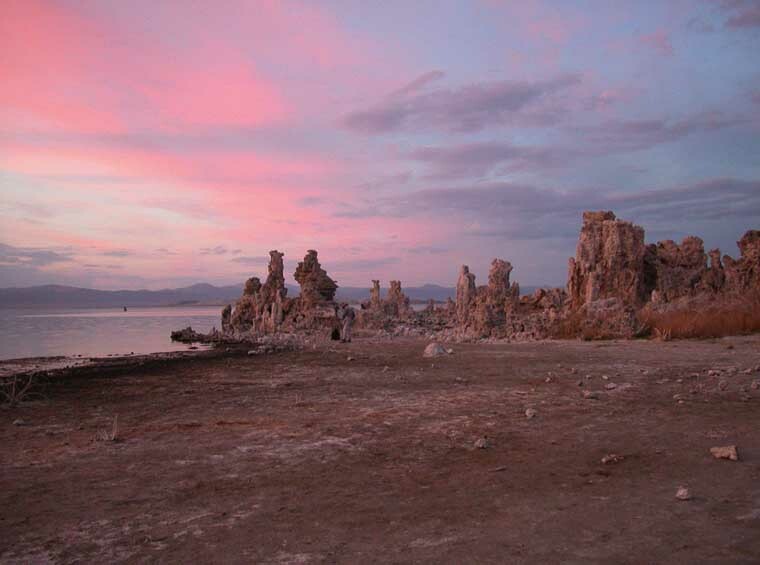 It has these amazing limestone and calcium pillars (called Tufa's) sticking up from the shore and lake. We took the trail down to the lake as the sun was setting so it was great for photos. 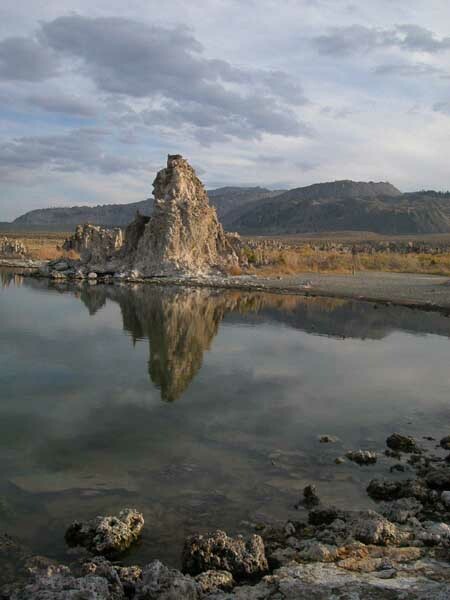 From Lee Vining, we continued south down 395 until Lone Pine. Then cut over to 95 through Death Valley. Probably the scariest road on our whole trip. Narrow and windy, we first had to descend from the Sierra Mountains down to the desert floor, then back up to 4900 ft. It was the only time on our whole trip we had to gear down to 2nd gear. Then we decided it would be best to unhook the car so the rig wouldn't overheat. Once we reached the summit, we hooked back up and took the long 15 mile decent to the floor of Death Valley. Unfortunately, we didn't realize we had another long grade up over the other side to get to Beatty. But we made it. Think we'll find a different route next time. Made it home this morning and found everything at home just as we left it. But as we're coming down 95 into Vegas, Fred went to apply the Pac Brake and it didn't work. Good thing it was still working yesterday when we were coming down those steep grades in Death Valley. Hopefully it will be something simple for Mr. Fix-It to fix. Have started the unpacking and cleaning. Can't believe all the stuff we have hidden all over the rig and car. While it is good to be home, we were sorry to see our trip end. We travelled 9621 miles and enjoyed every bit of it. We will always remember the fantastic scenery, interesting sites, and wonderful people we met along the way. Can't wait for our next adventure.